Project Nomad has never been registered in Australia and subsequently I have never insured it since it has been in my possession. With the restoration under full swing I thought I should look into insuring it while it was doing the rounds of various businesses in case something happened. This thought process was triggered by a visit to a local guru who had the unpleasant experience of having some of his customers cars vandalised. Two muscle cars were sitting outside his shop, one for a diff replacement and the other for smash repairs after a slight altercation. Some lowlife scaled the perimeter fencing during the night and armed with what appeared to be a small sledge hammer decided to smash both windscreens, inflict major panel damage and smash out the back and side glass to boot. This was a random act of vandalism by someone with an IQ that you could count on your left hand and probably have a few fingers left over. It turns out that because the cars were parked outside the workshop they were not covered by the business insurance. The insurance only covered everything inside the roller door. The owner wore the cost straight out of his pocket and had to repair the damage and his comments on the matter cannot be detailed here due to a deluge of expletives that would have Gordon Ramsay ducking for cover. 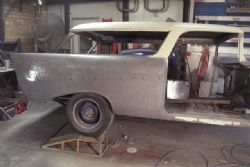 Given Project Nomad will be shipped on a flatbed numerous times and spend time in a motor trimmer, auto electrician and other trade establishments the need for insurance becomes apparent. 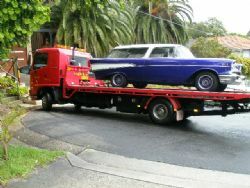 In the classic car market there are a number of things to consider when sourcing insurance. You want a policy that has an agreed value between you and the insurance company so that if the unexpected happens you know what you are covered for and how much the coverage is. Another prized option is the retention of the wreck. If the car is written off you have first choice to keep the car as you may choose to rebuild it yourself or use it as a source for parts for your next project. With the specialised nature of a lot of classic, hot rods and muscle cars I certainly want the choice of who will do any repairs on my car. As with all insurance policies it is well worth the time to read the documents thoroughly so that you fully understand all the benefits that are provided along with the conditions. Most classics are not daily drivers so a number of policies are based on the amount of kilometres traveled each year. The last thing you want after having to make a claim on your busted pride and joy is a major drama over the fine print in the contract. Due diligence now will save a lot of grief later on. With all this in mind it was time I sorted out the insurance whilst it was off the road. 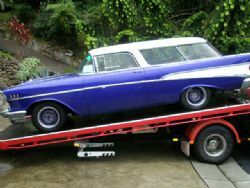 NRMA Veteran Vintage and Classic Insurance have a range of policies to suit their clients and all of the criteria that I had for insurance whilst the Nomad was off the road was covered. With the peace of mind a policy brings in covering your investment in your classic I realise I should have done this sooner.